THE TORONTO STAR Sat. Dec. 19,1998 BY JIL McINTOSH - SPECIAL TO THE STAR In the old-car hobby, there is a small but devoted group of enthusiasts who collect 'professional cars' funeral coaches, ambulances and flower cars. John Kellam took it one step further. He not only owns a funeral coach but has a funeral home as well. Kellam, the owner and director of McIntosh-Anderson Funeral home in Oshawa, has just acquired a stunning 1933 McLaughlin Buick. Originally a 'Ford man' whose hobby dates back to his high-school days, Kellam has owned a string of 1960s Mustangs and still has his 1970 Torino. He bought the McLaughlin partly because it was an antique car but also because it tied in with his business. Ironically, he had to travel over 600km south to find a car just 300km north of him. He wanted a General Motors product because of Oshawa's ties to GM, but he couldn't find one when he visited the giant Hershey, Penn. Automotive flea market in the fall of 1997. While he was there, members of an American Buick club told him about this one, located in Pakenham, Ontario. Upon returning home, he managed to track the car down and finally purchased it last January. He was pleased to find that the car was built in Oshawa. It is a 'combination car' meaning that it could be used both as a funeral coach and an ambulance, and first went into service at the Blair Funeral Home in Perth. 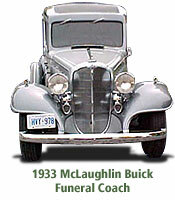 In the mid-1940s it was sold to the Zummach Funeral Home in Killaloe, Ontario. In 1955 it was retired from service and went into storage, going through a private owner before ending up in Kellam's hands. Like most funeral coaches, it didn't see a lot of use and has only 42,130 miles on the odometer. Despite being stored for 43 years in a dirt-floored shed, it is remarkably solid although it was very dirty. We scraped a lot of rural Ontario off the underside of the car," Kellam said. Earlier this year, Kellam had the car's original black paint replaced with a becoming combination of charcoal and gray. He plans to spend the winter replacing the wiring and bringing the straight eight engine into perfect condition. He recently received old photographs from the Killaloe funeral home. They show that the car is basically in original condition, except for a rear fold-down step bumper replaced with a curved one. He still needs to find some missing items such as rnirrors and wiper arms. So far he has been unable to determine the coach builder. There were several Canadian companies that turned factory-built chassis into coaches, but the car doesn't carry the customary identification plate. He hopes that another enthusiast will be able to help him with this. He has owned the car since January, but has yet to drive it. "I heard it run when I bought it, and that was only 16 degrees above zero," he said. "It's been driven on and off the transport truck for delivery, and the trailer to go to the body shop, but that's it." He plans to use the car as any other hobby car and hopes next year to participate in local shows and cruise nights with it. "My wife Willie has been more supportive in terms of time and money with this car than with any other I've owned," he said. "I guess it's because she knows I'm not going to be taking it drag racing." He hasn't ruled out the possibility of returning the car to active service. "There are a few funeral homes in Ontario that have antique coaches and they do get requests for them" he said. "The main issue is mechanical competency. I have to be able to depend on it completely. I was in a procession once when the funeral coach broke down. It is terribly embarrassing for everyone involved, just horrible." He has already received calls from people interested in using it for funerals and from a couple who wanted to use it in their wedding and a Dixie-land jazz band who wanted to be photographed with it. 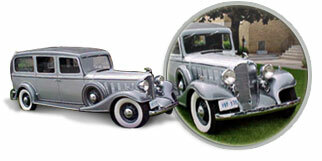 It may be just a matter of time before the '33 is once again called on to provide a classic - and very classy - last ride. Jil McIntosh is an Oshawa-based freelance auto writer who specializes in rods and old cars.